Dr. Mary Schmidt Campbell, Director from 1977 to 1987, generously agreed to be interviewed and to share her personal perspectives and stories about her time at the helm of the Museum. Her comments are edited and condensed here. I was working on my dissertation on Romare Bearden and I was asked to do an exhibition of his work at a museum up in Syracuse, where I was in school. I had never done an exhibition in my life. I had no idea what it was to be a curator. But I thought, “I can figure it out.” So I identified the top curator at the museum there and I said, you have to help me. So she helped me put together this exhibition. We opened it to the public and Mr. Bearden and his wife came up to see it. And he liked it. And I thought, “Well, that's great.” And then I didn’t think any more about that. About two years later, in the spring of 1977, I get a telephone call. My middle son was an infant, and I’m walking around with him in my arms. It’s Mr. Bearden on the call and he says, “I have just the job for you. They’re looking for a Director at The Studio Museum in Harlem.” And my heart jumped because that was where I first saw his work, and I thought, “This is perfect.” So I go to New York. Nancy Lane is on the Board of Trustees, she’s one of the people who interviews me, along with Bertina Hunter, bless her heart, she was wonderful, and a number of other trustees. And lo and behold, I got the job. I came to the Studio Museum on October 1, 1977. I was twenty-nine years old. What was Harlem like at that time? When I came to Harlem, New York was on the verge of bankruptcy. The year before, there was a big headline in the Daily News: “Washington to New York: ‘Drop Dead.’” And there was a real question about the future of the city: If the city could barely pay its bills, why would it be supporting cultural institutions? And I have to say, the city of New York made a really courageous decision. They decided that they were not going to cut culture. They had to support the city’s cultural life because that was really the lifeblood of New York. It was an incredibly interesting time, because there was so much energy and determination to put the city back together. It wasn’t just Harlem but Chelsea, Brooklyn, the South Bronx, and all different parts of the city that were trying to come up with ways to piece themselves back together and revitalize New York. Can you tell us about the move from the loft space at 2033 Fifth Avenue to 144 West 125th Street? When I was interviewed for the job, every single trustee who interviewed me said, “We want a real museum.” What they meant by that was, we want to build a permanent collection; we want to have our own building; we want to have programming and publish catalogues. The vision was always tied to the notion of having a place of our own. Now, to tell you how broke New York was in those days—a bank had foreclosed on the building, and it was more expensive for them to hold onto that property than to give it to us. So, they decided that it was in their interest actually to make a gift of this 60,000-square-foot building to the Studio Museum. We were determined to have a black architect and a black construction firm. Max Bond had his own firm and he was a visionary. Max had a whole idea of what Harlem could become architecturally. So, he gave us a very simple, elegant, and cost-effective design that stood us in good stead for thirty years. It was really incredible. And it came in on time, and on budget, and we loved that, too. When the Studio Museum moved from the loft to the building, I think it became one of the linchpins for the rebirth and revitalization of Harlem. And we're now at a point where the Museum is reaping all of the benefits of that. All the retail outlets that have come uptown, all the population that has come back to live in Harlem, the restaurants, the other cultural institutions that are thriving in Harlem, have made it an extraordinarily exciting place to be. 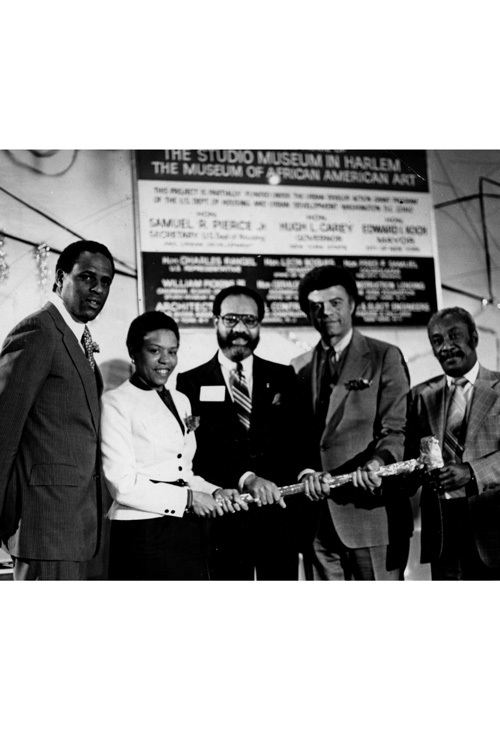 H. Carl McCall, Mary Schmidt Campbell, Arthur Barnes, Robert Carroll, and Fred Samuels at The Studio Museum in Harlem’s groundbreaking ceremony for the 144 125th Street building, May 20, 1981. When the Studio Museum moved from the loft to the building, I think it became one of the linchpins for the rebirth and revitalization of Harlem. Tell us about some of the people you worked with. While I was there, David Hammons, Alison Saar, and Kerry James Marshall were all artists in residence. That was pretty incredible. I think about all the MacArthur awardees who have been associated with the Studio Museum. What other museum in New York can boast that number of “geniuses”? The other thing that’s amazing that is the number of museum directors and leaders who came out of the Studio Museum: Terrie Rouse, Grace Stanislaus, Deirdre Bibby, Sharon Patton—it was a place that incubated talent. Kinshasha Holman Conwill was my deputy. I had interviewed, I don’t know how many people to be Deputy Director. Kinshasha walks in and we talked for about five minutes, and I knew she was the one. She not only had been an artist herself, but her husband was an artist, she had gotten an MBA—she just lived and breathed what The Studio Museum in Harlem was about. And we would get these incredible interns every year—including one named Thelma Golden. The thing that I remember about Thelma is that she came in knowing about art history. Very often we’d get interns and we’d have to also be the starting point for their knowledge about the history of art and being a curator. But it was like she was born knowing that she wanted to be a curator. She wanted to understand the work, the process, the mind, the consciousness of artists. It was such a joy to be around her because she had such a clear sense of herself. And she hasn’t changed. She is still that same person, with an incredible generosity to boot. I think what’s remarkable about the Studio Museum is that the board, when I came there, was not a rich board. It was a board of ordinary citizens who held an absolute firm belief that they could build a real museum in the center of Harlem and it would be an A-plusgold-standard museum. Nobody ever wavered from that; we just waited for other people to get on board. And pretty soon, we had a critical mass of people who believed that, too. Anyway, that was our life at the Studio Museum. I loved it because we were inventing every day. We were inventing how to organize this place, inventing how to get the shows up on time, inventing how to get the catalogues out. And every time we invented we were learning something, too. So it felt like being in a school all the time. That was my best graduate education, ten years at the Studio Museum.